I recently covered the importance of anchor text and the dangers of using keyword rich anchor text for backlinks. So what about your internal linking strategy internal linking strategy? Should you be careful using keywords within your anchor text on your internal links? Can you go too far? It’s an important question with some debate surrounding this issue. Myth or reality? I’ll try to answer that today. What are internal links and Anchor text? Internal linking, especially on authoritative sites can have a dramatic impact on your rankings. This is because of the way Google uses PageRank. I don’t really like to talk about PageRank anymore because Google stopped updating the public PageRank metrics in 2014 I believe. So when people talk about High PR Sites I usually just roll my eyes. You shouldn’t be judging a site based on its PageRank. Instead, you should be using a variety of other metrics like PA, DA, DR, UR, TF, CF, etc. However, Pagerank is still used internally by Google. Of course, it is much more advanced now than the PR we were used to back in the day. And if you have a high authoritative site (maybe it’s high DA or High DR), then Google will still be measuring that internally through their PageRank metrics along with many others. This gives authoritative site owners a chance to use internal linking to pass more of that PageRank (link equity) to other internal pages. Don’t get too caught up on a number of links or anything like that. Just link in a natural way, and link to landing pages you want to rank more than other pages. Or link from your highest PA pages to your landing pages. For example, say you wanted to rank a deeper page that wasn’t doing as well in the search engines as you wanted. Maybe you decide to start using internal linking from many of your other pages, which happen to have a lot of backlinks pointing to them. After using an internal linking strategy that is helpful to users, and helps transfer some of that link equity to certain landing pages, you may see a jump in rankings for those pages. It can actually have a pretty powerful effect if done correctly, and with user experience in mind. Keyword rich anchor text – both exact match and partial match, can play an important role in your internal linking strategy. Google looks at the content on your page to decipher what your content is about. They look at all the keywords and associated keywords. Google’s ability to know what your content is about, has gotten pretty advanced over the years. Google will also look at all the keywords in all the anchor text pointing to your page. This includes both onsite and offsite links (backlinks). It does this to get further clues to what a webpage is about. I believe Google still adds a lot of weight to keywords in your internal anchor text. I believe the same is true with your backlink anchor text profile. However, when using keyword rich anchor text with your backlinks, you need to use keywords modestly and with caution. The same is actually true for internal links, but you have to be much more careful with backlinks. Google takes many things into account. Why not make it easier for them to decide what your content is about? Give them a piece to the puzzle with your internal links. Should you use keywords in your internal links (keyword rich anchor text)? Short answer: Absolutely! Just don’t keyword stuff. Also, make sure you vary your anchor text so it is natural and appeals to the reader. Over-optimization, as it applies to your on-page SEO is optimizing your site so much, to the point where it is causing a bad user experience. That’s it. I don’t think it goes much further than that. I am not talking about all aspects of over-optimization, I am talking about the keyword rich anchor text aspect. If you are keyword stuffing where it sounds unnatural. That is over-optimization. On the same token, if you are keyword stuffing the anchor text of your internal links – to the point of reducing the flow in your writing, that is also over optimization. This is all pretty common sense. Some SEOs tend to get over-focused on the optimizing part. We need to step back every once in a while and realize that SEO is about offering real value and communicating that value to Google’s search algorithms through our optimizations. In fact, it is completely natural to include keywords in your anchor text. It helps describe what the page is about to the user and search engine bots. You will not get penalized for keyword rich internal links if you do within reason. You should use descriptive, keyword rich anchor text since it increases the user experience. SEO is more about the user experience these days. The AI, the UX, and even your design, all play a big role in SEO. They offer a lot of indirect benefits to SEO (i.e user behavior). Offering value and good UX is the first priority. If your optimizations get in the way of that, your content just reads and feels spammy. So over-optimization, in my opinion, is just a word used to describe bad content and bad UX. In general, if done in a natural way, I say go ahead and use as many keywords as you want in your internal linking, as long as you vary the keywords. There is a caveat to this and it’s an important distinction. If you are adding in anchor text in a way that keyword stuffs your content with your chosen keywords, it is probably not the best idea. Meaning, if you add anchor text in an article that contains your keywords, and it just doesn’t sound right (you are forcing the keyword in your content), Google and your users will view your website as a little spammy. When the anchor text doesn’t flow with the content, you may be over-optimizing. It really comes down to focusing on the user and the flow of the content, rather than a search algorithm or a certain keyword distribution. If you have a WordPress plugin, for instance, that goes through your site and links to a landing page every time it finds an instance of a word – that may definitely be seen as spammy. Even though I absolutely love automation in marketing, this is the kind of thing that can get you into trouble. You shouldn’t automate everything, and this is especially the case when it comes to SEO. If you have keyword rich anchor text in any of the following areas of your site, it can be risky. Though in some cases it may seem to do nothing, or even help, in my opinion, it is still risky, especially on lower authoritative sites. In my mind, reading Google’s reasonable surfer patent tells me that links in the footer would not be considered part of the main content, and would thus carry less weight. However, it is a sitewide link, so that is pointing to certain pages of your website on every page. If you are adding keyword rich anchor text in your footer for external links, it may be seen as pretty spammy (unless you nofollow). However, internal links can have the same effect, especially if you do it a lot. Even if you don’t use any sort of plugin or bot to create anchor text automatically, you can still overdo it when adding keywords to anchor text manually. If you have a lot of internal linking where the exact match keyword is used excessively, is that going to trigger an over optimization penalty? I honestly don’t think it will. If it fits in the content and flows nicely, I don’t think so. Maybe if every single anchor text pointing to a specific page, and it was just overly aggressive to the point of being spammy – maybe then it would have a negative effect. But I don’t really think an over optimization penalty works this way. I think it only kicks in when your content turns spammy. If your content offers a great user experience, I don’t think it will harm you. What Other SEO Influencer say: Should you use keywords in your internal links or not? Over-optimization has been an SEO buzzword for a while. The concept of over optimization can cover many aspects of on-site and off-site optimizations. Naturally, I see people asking – Is internal linking with keywords spammy? Can you use too many keywords? Is that spammy? That’s a great question, especially considering that your internal linking strategy and the information architecture is such a foundation to good on-site optimization and user experience. Because of this over optimization craze, there is some debate about whether keyword rich anchor text is good or bad. There is some debate about whether you should use any keywords in your anchor text. 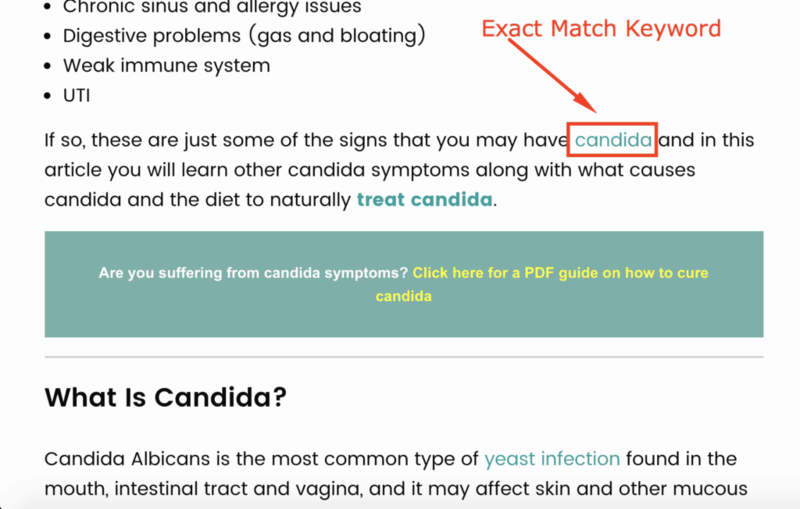 For example, Neil Patel says that keyword rich anchor text is bad. If I had to pick the single biggest oversight in over-optimization, this would be it. I know, I know. Neil Patel is a well-known SEO expert, right? Well, I think his biggest strength is content marketing & personal branding. In fact, he is world class when it comes to that, you gotta give it to him for that. Also, I always say SEOs are like economists – we all have our own opinion. And we also change our minds and adapt to new situations. But we can’t fault him. I don’t agree with what he says, but I have a lot of respect for him. There’s a lesson in here though: the “gurus” don’t always get it right. You have to think for yourself and question the status quo. The days of keyword stuffing anchor texts are long gone. But, there is value in having that anchor text. Anchor text that flows well with the overall content, versus over-optimized anchor text, is best. Of course, you should make your content flow naturally, for the sake of user experience. If you are stuffing your keywords in your internal links, and it doesn’t flow very well when reading, that is over optimization. Or rather, it’s just bad writing. So if you are doing that, stop! But if it naturally flows, don’t be afraid to use keywords in your internal links. You can’t really over-optimize your internal links, as long as it gives a good user experience. This assumes you naturally add the anchor text within the flow of your content – which would naturally vary your anchor text keywords & phrasing. If you do this then it is hard to over-optimize. Otherwise, if you are using the same keywords over and over in your internal linking, it actually is quite easy to over optimize. So just be careful. Note: just because a writer wrote something, it may not represent SEMrush’s views. But hey, we all love SEMrush, we can’t fault them. That could have just been that particular writer. All the major SEO tool companies tend to pump out great content on their blogs (ahrefs, semrush, majestic, moz etc), so I definitely recommend following SEMrush, along with the others. They have some great articles. While you want to use the terms that will indicate to the engines what the subject of the target page is, you don’t want to overdo it…The goal is to use your anchor text when appropriate. Use verbiage that includes your keywords when possible and will also be descriptive to your human visitors. Basically, if you have internal links that are heavily anchor-text focused, there’s lots of them, they’re often sitewide, and they live in nav elements or in the footer, and add little to no value for users (they’re just trying to pump up your rankings in Google), then Google might take action against your site. We’ve seen plenty of examples of this, and when the manipulative internal link blocks are removed, rankings suddenly go back up. It seems Google has a pretty smart and pretty immediate filter for this type of thing. My answer is, typically not. He says typically not because he meant it will not harm your site if you have a real site. If you have a normal site and you aren’t being overly aggressive with the internal linking using keyword rich anchor text, and it offers a good user experience, you are good to go. Note: this video is from 2013 – a year after Matt Cutts declared that they were working on something to address the over optimization. So this tells me something. Everyone who lumped in the “internal linking anchor text” into this over optimization craze may be wrong. Matt himself is saying that it’s okay, even after he talked about Google’s new over-optimization penalty. Okay, so I’m showing a video of Matt Cutts… from 2013. Many people would dismiss it because it is 4 years old at this point in writing (2017). The thing about white hat SEO is that it doesn’t change as much as you think, and definitely not as much as black hat. The foundations are pretty stable. So a lot of Matt Cutts early videos from are still very applicable to this day. Sure, you may want to take what he says with a grain of salt since he was a Google employee. But you can still learn a lot based on what he suggests, especially if you are new to SEO and want to follow the white hat approach. Even experienced SEOs may be able to get some value out of his videos. I highly recommend checking them out. Note: If you want more current advice straight from the horse’s mouth, follow Gary Illyes on Twitter. He always gives fantastic advice. How important is the anchor text for internal links? Should that be keyword rich? Is it a ranking signal? We do use internal links to better understand the context of content of your sites. So if we see a link that’s saying like red cars pointing to a page about red cars, that helps us to better understand that. But it’s not something that you need to keyword stuff in any way because what generally happens when people start focusing too much on the internal linking is that they have a collection of internal links that all say like 4-5 words in them, and then suddenly when we look at that pages we see this big collection of links on the page, and that’s also text on the page, so it’s looking like keyword stuffed text. So I try to just link naturally within your website. And make sure that you kind of have that organic structure that gives us just a little bit of context, but not that you’re keyword stuffing every anchor text. So does Wikipedia over optimize their internal link’s anchor text? They do a great job with their internal linking, which is beneficial both for bots and human beings. Do you know how many keywords Wikipedia ranks for? A LOT. Of course Wikipedia is a very popular site with millions of backlinks, but still. Their internal linking thought their whole site using keyword rich anchor text, I would say is helping, not hindering their success. Note: large sites often don’t get the same treatment from Google. They are often allowed to do things riskier than smaller sites, because of their authority and trust. So this could be a weak argument on my part due to this reason. His content is amazing, their SEO is on point, and they receive a healthy growth of links over time, so they are doing quite well in a competitive field. Especially considering the time period that they achieved all that success. It took about 2 years to go from 1,500 backlinks to 20,000. That is quite a big jump in a short period of time. Needless, I have a lot of respect for their marketing team. With that amount of growth in (natural) backlinks, they know what they are doing. That includes their on-page SEO and keyword rich internal linking. So why is he doing so good? Is it his internal linking? Of course not. But with SEO, all parts equal the whole. The micro enables the macro. If I were to give one reason they are doing so well, it’d be great content marketing and building his brand. Great content marketing is really the new SEO since it takes care of two 80/20 activities in SEO: great content and great outreach, which results in links and good user behavior signals on site. With that said, I think their internal linking and on page SEO strategy is helping their rankings by adding relevancy signals to those pages. Just a quick update. I believe you now have to be more careful with over optimizing on-site factors and that includes keyword rich internal linking. There was an update in March that didn’t get hardly any press, but one that I think was a major update. So just keep in mind that this article is still relevant, but now you should be focusing even more on alternating your internal anchor text, as it is riskier if it doesn’t look “natural” (i.e too many of the same exact match keywords in your anchor text). Note: SEO is all about pivoting, and I constantly pivot my views and strategies as Google evolves or when I learn something new. I’ll be the first to admit I probably say things that are plain wrong, or I’ll have outdated articles that I haven’t gotten a chance to update. But, I’ll adjust my views. This article still holds true and has been updated slightly for 2018. Previous PostAre Links From Lower Domain Authority Bad? Next PostReverse SEO - What Is It And How Do You Do It?